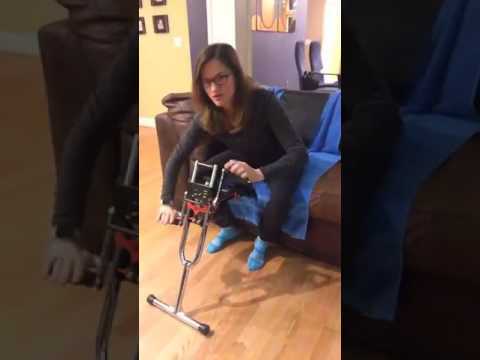 Get to Know Your Excy (short for exercise cycling) Portable Cross Training System. Welcome to Day 1 of the Excy Move More Challenge. This challenge is all about getting to your Excy portable cross training system and how to put the versatility of our workouts to great use anywhere. Our first workout is about using Excy as a recumbent exercise bike. 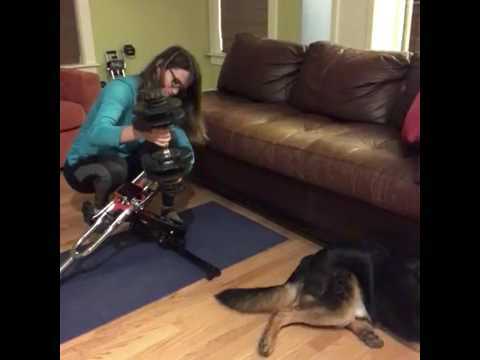 Traditionally, when people think of a stationary recumbent bike (or any stationary exercise equipment), they think about using the equipment in one place in their home. We ask you to approach this challenge with an open heart to think about exploring ways to use Excy anywhere in your home, at work, or during your everyday life on the go. We will get into multiple positions, introduce the versatility of the workouts, and help you discover a broad range of resistance levels. Our hope is that you discover so many ways to spin, crank, and play with Excy anywhere to get the results you want. 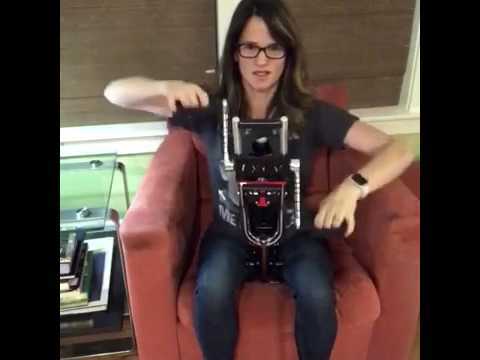 Today we kick off Day 2 of our Live Move More challenge on Facebook, which is all about getting to know Excy as an arm bike (similar to an upper body ergometer, but more versatile) for aerobic, anaerobic, and range of motion exercises. All too often, when we think of wanting to burn calories or build muscle, we go right for exercises that impact the Gluteus maximus (glutes) because it’s the largest muscle in the human body. But, a very close second is the bilateral latissimus dorsi muscles which are your “lats” and one of the widest muscles in the human body. So, we can’t forget to put our “lats” to work, especially after keeping our upper body confined all day working at a keyboard or holding our phones with our arms in a Tyrannosaurus rex position! Your upper body needs the same attention as your lower body and vice versa. So, don’t hesitate to crank Excy anytime for an upper body arm bike workout on your schedule! 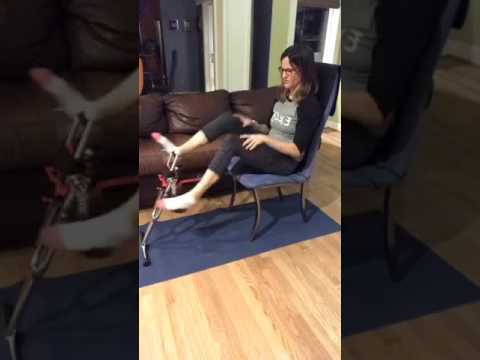 Today we kicked of day 3 of the Excy Move More 30-Day Challenge, where we use our patent-pending approach to prevent the Excy portable exercise cycling system from scooting away at varying degrees of bi-directional resistance. Not only is this a great workout for the physically fit or fitness beginner with zero-30 pounds of resistance, but this approach can also be used in many different ways, including a bed. 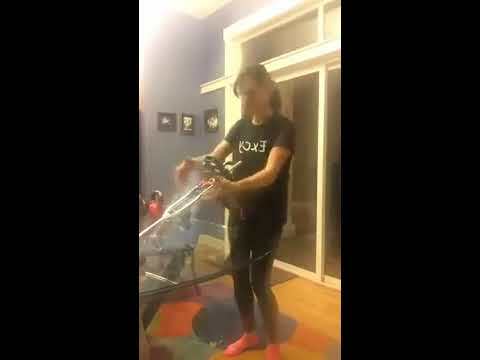 Day 4 of the Excy Move More Challenge focuses on using Excy as an arm bike on the floor for a great cardio and strength training workout. This is one our most popular exercises with a leg injury. In 2010, the American Council on Exercise sponsored a study of a class that features pedaling arm bikes to the beat of music. The researchers concluded that using an arm bike in a group setting can provide a high-intensity, calorie-burning cardio workout. Participants burned an average of nine calories per minute while pedaling the bike and maintained a heart rate of about 86 percent of maximum during a 30-minute session. So, don’t forget this favorite position with Excy! Today is all about getting to know your Excy system and discovering Excy’s broad range of resistance that is super easy to adjust on the fly. 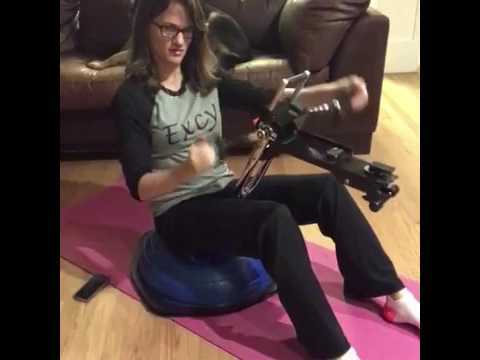 During today’s Excy workout, we explore using Excy as a recumbent exercise bike where we will spin, crank, and even play to get more movement using a variety of workout levels. During these early days of getting to know Excy, keep the resistance levels easy and just play. Seriously, have fun and explore. 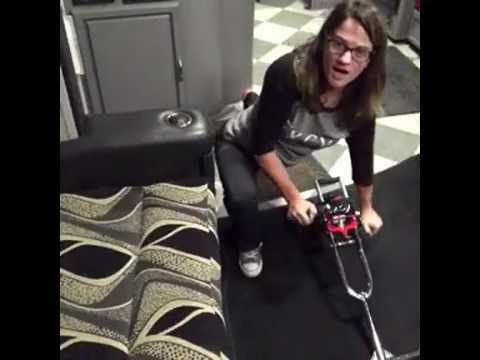 In today’s workout, we turn an RV couch into an exercise bike while traveling. 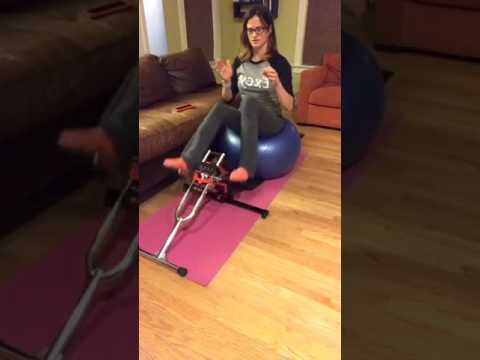 Excy (short for exercise cycling) allows you to turn any couch into an exercise bike with bi-directional resistance that ranges from zero to 30 pounds. 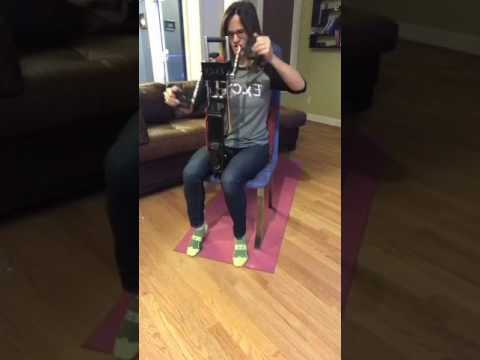 Excy is a lightweight, compact, and portable full fledge upper body ergometer, recumbent exercise bike, and strength trainer in a tiny 10-pound package that folds for easy storage and transport. Our patented approach offers over 100 different workouts with zero to 30 pounds of bi-directional resistance and is the perfect utility for physical therapy, home fitness, and group training at home, work, or on the go. Because of its small size and simplicity, it’s easy to do while watching TV or anywhere at home with the family, on the go with friends, in the office at your desk, or while traveling for work or pleasure. Excy provides a broad range of light to high-intensity low impact workouts for toning the upper and lower-body, boosting aerobic capacity and burning calories. 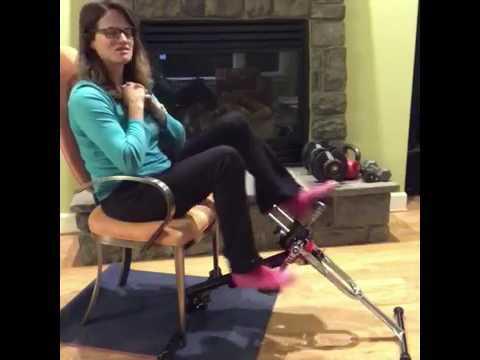 Today we use Excy to turn any chair into a quality, easy to use exercise bike. 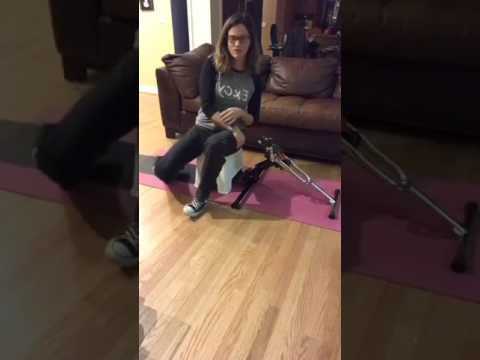 Today we explore one of many ways to use Excy as an upper body arm bike on the floor using varying ranges of bi-directional resistance from zero to 30 pounds. 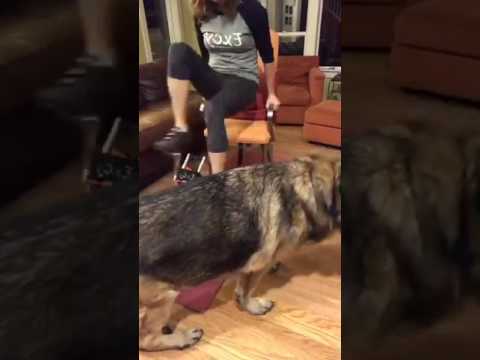 Today, we learn how to use Excy (short for exercise cycling) as an exercise bike on the floor. 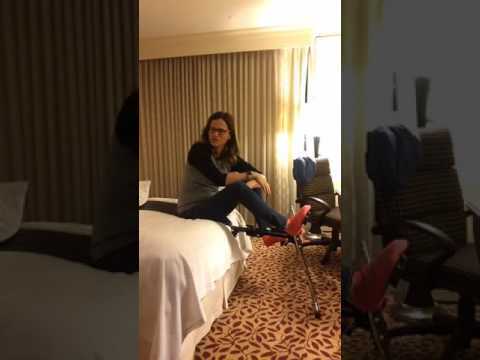 Excy is a lightweight, compact, and portable full fledge upper body ergometer, recumbent exercise bike, and strength trainer in a tiny 10-pound package that folds for easy storage and transport. Our patented approach offers over 100 different workouts with zero to 30 pounds of bi-directional resistance and is the perfect utility for physical therapy, home fitness, and group training at home, work, or on the go. Because of its small size and simplicity, it’s easy to do while watching TV or anywhere at home with the family, on the go with friends, in the office at your desk, or while traveling for work or pleasure. Excy provides a broad range of light to high-intensity low impact workouts for toning the upper and lower-body, boosting aerobic capacity and burning calories. Every workout is tracked by the Excy mobile app to measure exercise intensity, monitor burned calories, and coach people to achieve a higher level of intensity. You can use Excy in this position on the floor or explore the workout using a BOSU Ball. Either way, it’s a great way to tone up with quick bursts at higher resistance or keep the resistance easy and focus on getting an amazing total-body Excy BOSU-ball workout. The BOSU ball can be used to make the upper body exercise extra challenging because it adds an awesome element of instability to your workout, forcing you to use your core to stay steady. 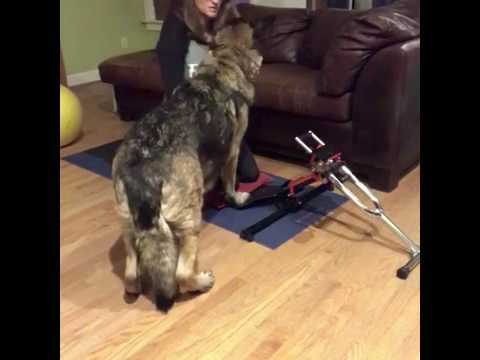 In today’s workout, we use the Excy portable cross trainer to turn a standard chair into an exercise bike. We demonstrate adding the toggle ties and the Excy Bar for added stability. This may be perfect for your fitness needs if you want something that is convenient and easy to use, yet packs a pretty good punch right from the comfort of your favorite char. 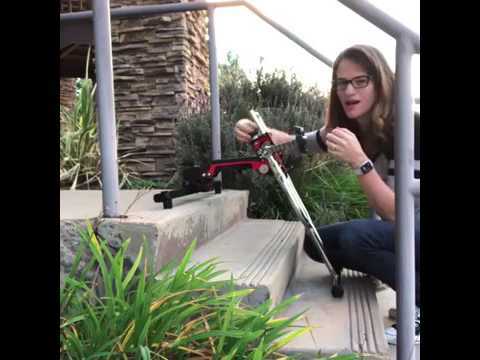 Excy can be used indoors or outdoors, rain or shine. So, you can do this anywhere. Crank up the resistance double-dip on strengthening your cardiovascular endurance, but also overall strength. Start off with a moderate intensity cardio to burn calories or just prepare your body for more challenging exercise as we move into more challenging positions. Then, incorporate high-intensity interval training or short bursts when you can! In today’s workout, we use the Excy portable cross trainer to do some lunges while incorporating some arm bike movements. Today, we are exercising in an RV during a road trip. You can do lunge exercises with Excy anywhere. Incorporating arm cycling offers up even more total body movements. Your legs and backside will feel the effects in no time and your arms too. If you’re planning on incorporating lunges into your routine, however, make sure you’re not doing more harm than good. Find out how to do lunges correctly. In today’s workout, we use the Excy portable cross trainer to turn a picnic table into a recumbent exercise bike. There’s such a wide variety of recumbent exercise bike positions with Excy that we’d love you to try. Recumbent bikes have been hugely popular pieces of exercise equipment because you can excellent workout while reclining in a very comfortable position. With Excy, we take it even further by making it possible to use Excy as a recumbent exercise bike anywhere and with any chair. It’s a great way to either warm up the body for further workout routines, or for a solid workout in itself. Since you can take Excy anywhere, keep it with you to stay motivated to get those great workouts underway without having to worry about disrupting your schedule. At home, leave Excy somewhere you can see it (preferable somewhere where it’s staring you in the face where you otherwise might sit idle…. begging for you to get on and get cycling). But, take it with you too to squeeze in a workout anywhere! 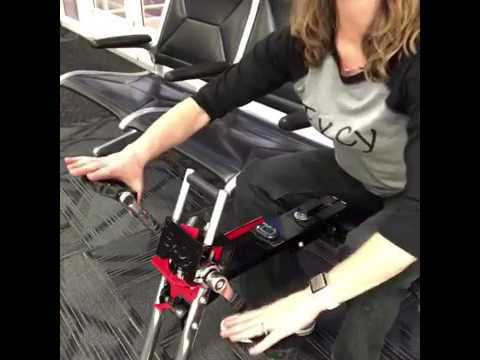 In today’s workout, we use the Excy portable cross trainer to turn a chair at the airport while traveling into an upper body workout using Excy as an arm bike. We know the Excy system does a great job with leg workouts, but don’t forget arms! And of course, cross train between both when you can. It’s pretty amazing what you can do with Excy as an arm cycle to not only tone, but also get a great cardio workout to burn calories. It use to be that you could only find quality arm cycle exercise systems in rehab centers or very light resistance arm cycles on Amazon. With Excy, we want you to put the resistance to work for your arms and legs and take Excy anywhere to not miss a workout ever again. 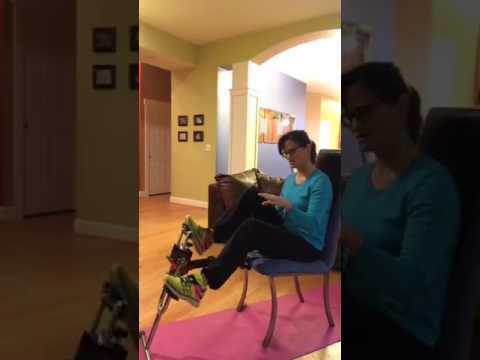 If you have a leg injury, you can use Excy as an arm bike as an amazing alternative to a treadmill, walking or jogging. But, don’t hesitate to crank up the resistance to build stamina and resistance for sports performance or to burn some serious calories. 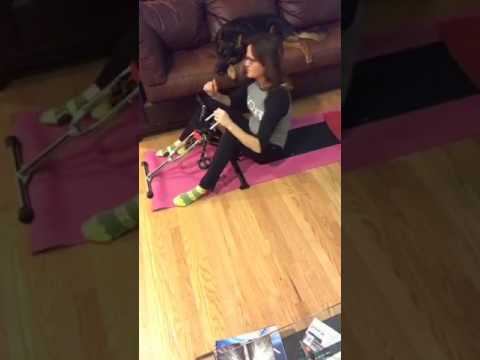 With the Excy portable cross trainer, it’s incredibly easy to turn Excy into a recumbent exercise bike to cycle indoors using your favorite chair while watching television. Seriously, Excy and Netflix make a perfect couple to binge watch your favorite show, while getting movement or burning serious calories. But, the good news is that you can also take Excy anywhere as a reliable recumbent exercise bike to also get fresh air. So, make sure to take Excy with you to turn typical sedentary moments into an opportunity to train. Explore the adjustable resistance and get a feel for how you can scale your workouts from easy to intense to seriously difficult. Crank up the resistance for more strength training, but you can also spin for lower intensity. You are in complete control. In this recumbent bike position, it’s super easy to recline back and enjoy the ride without impacting your joints. As you crank up the resistance, imagine yourself on a steep incline hammering a real bike on your favorite trail. But of course, take moments to coast too. Either way, enjoy the ride. There are a lot of amazing upper body strength training exercises to explore with Excy as an arm cycle and cross trainer. You can crank the resistance high to really focus on toning, but also work through range of motion and to simply move more too. Excy is all about making upper body training easy, yet efficient. You can do upper-body intensive routines with the resistance cranked high to seriously engage your back, chest, shoulders and core. Add the bar for more stability. Lighter resistance will help get the joints moving and can also be a great warm up. Start at an easy pace. You can add things like a Bosu Ball or exercise ball to make it even more challenging. Sure, we work legs too as an exercise bike and maybe that’s why you purchased an Excy, but don’t forget to embrace Excy as an upper-body resistance trainer. 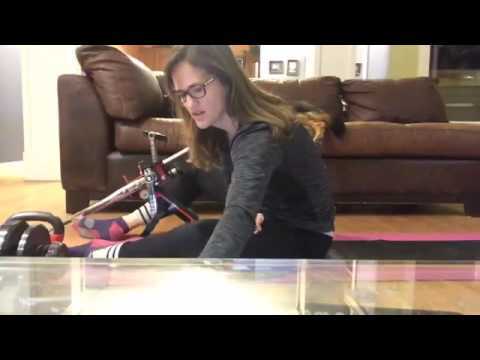 Today, we use the Excy portable cross trainer while performing a cycling bridge exercise from a couch, which is intended to improve leg, lower back, core, and gluteus strength. The higher you crank the resistance, the more challenging the bridge exercise will be. There are so many ways to officially do a bridge exercise, but today we focus on a basic bridge with our feet pedaling Excy. The bridge position can also be done while laying on the floor with Excy, but today we explore the bridge position from a couch with your feet firmly on the pedals hip-width apart and lifting your glutes through each crank of the Excy cycling system. 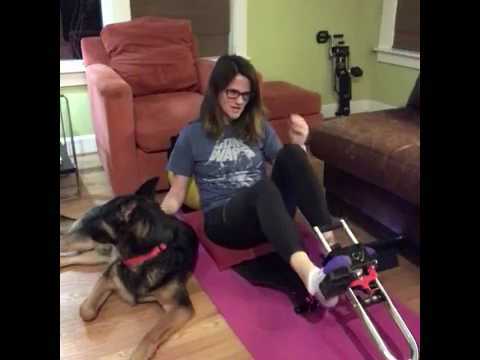 Excy is absolutely amazing as an arm bike, also called an upper body ergometer (UBE), and can be an amazing way to get your heart pumping for cardio and also double-dip on strength training while giving your legs a rest. Even if you purchased your Excy cross trainer to be used as an exercise bike, we invite you to try Excy as an upper body ergometer! The quality of our bi-directional resistance is typically only found in rehab centers or a gym, but now you have it in the convenience of your home, at work, or on the go. We invite you to explore Excy as an arm bike for the joy of a solid cross-training alternative that can spice up any fitness routine. It’s an awesome opportunity to get our arms out of their T-Rex zones where our hands are on keyboards, steering wheels, or our smartphones. UBEs are also known to be ideal for offering a progressive range of shoulder, elbow, wrist, torso, and back strengthening and conditioning. 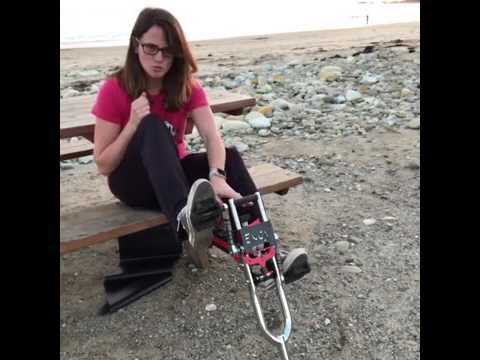 Excy can also serve as a great way to train for those with restricted lower limb mobility. Make sure to closely coordinate with your physical therapist or personal trainer if you have a history or are recovering from a shoulder injury. Welcome to Day 21 of the Excy Move More Challenge. Today, we turn the Excy portable cross trainer into an exercise bike using an exercise ball with the Excy Keeper and the Excy Stability Bar. This 30-day introduction to Excy challenge has been about getting to know your Excy system and discovering the time and place that works for you to squeeze in more exercise. In so many ways, you can use Excy to focus on your core, but adding an exercise ball adds a new level of instability to make those trunk muscles strong. With your legs being the most tangible source of power, you can still focus on getting those cycling legs, but adding the exercise ball can be a fun way to engage the core muscles—abs and lower back—which is a vital foundation from which all movement stems. Don’t let a weak core frustrate all the hard work your legs do on the bike. Here’s how to make those important trunk muscles strong. Welcome to Day 22 of the Excy Move More Challenge. Today, we turn the Excy portable cross trainer into an arm cycle (similar to an upper body ergometer-UBE) using a standard chair. 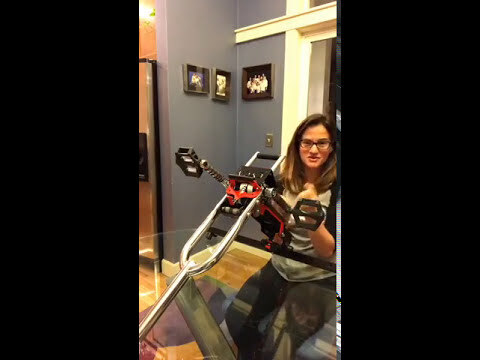 Similar to a traditional upper body ergometer, Excy can be used to strengthen and condition your upper body, as well as get an amazing cardiovascular workout by only using your arms. While upper body ergometers are not as well known as treadmills and ellipticals, there are so many benefits from incorporating them into your fitness routine. Give this one a try even when you only have 1 or two minutes to spare. It can be a great exercise for range of motion, but you can also crank up the resistance to perform all kinds of activities such as pushing, pulling, reaching, rotating, and curling. Welcome to Day 23 of the Excy Move More Challenge. Today, we turn the Excy portable cross trainer into a recumbent exercise bike for higher intensity spinning, cranking, pushing, pulling and extension. 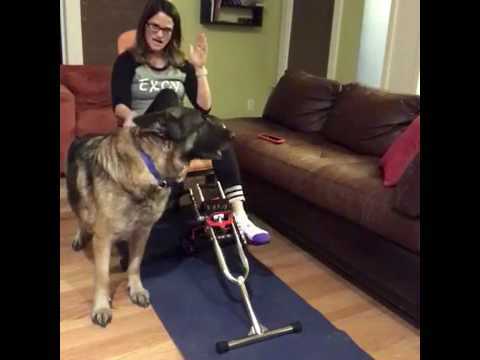 Todays workout includes the Excy Keeper with toggle ties, which allows you to firmly attach the Keeper to a chair with four-legs. While the Excy Keeper will hold the Excy system in place firmly using your body weight, pushing it really hard from a chair is made even easier with the toggle ties, especially if you want to crank up the resistance as high as possible. Day 24 of the Excy Move More Challenge. Using Excy for Arm Cardio and Core Training. Welcome to Day 24 of the Excy Move More Challenge. Today’s workout is all about focusing on our upper body as a way to build cardio fitness by using Excy as an arm cycle or upper body ergometer. This is a low impact upper body workout that works both flexors and extensors in the shoulders, scapula and elbows, while also giving you an amazing core workout. 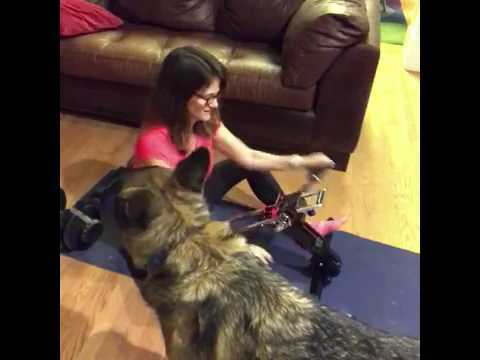 In this exercise, you simply turn Excy around in a reverse position and crank the handles in full or partial circles using your hands, the same way you would turn the pedals on a bike with your feet. By leaning back, you can go for some serious core strengthening. Set your speed and resistance to increase or decrease the difficulty. Please note that your arms should not quite fully extend while spinning (focus on a 5-10 degree bend at the elbow). Welcome to Day 25 of the Excy Move More Challenge. Today we use the Excy portable cross trainer as an exercise bike with cycling shoes. We have added the bar for extra stability, as well as used the toggle ties to tether Excy to the chair. Adding cycling shoes is a fun, effective way to blast some serious calories and dive right into an amazing cycling workout from anywhere. You can increase or decrease your intensity by simply adjusting the resistance. You can add in some dumbbells to get an even higher intensity workout. 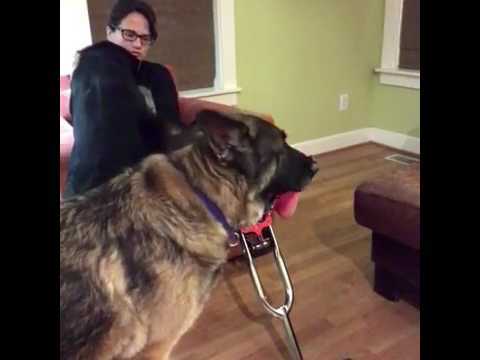 Make sure to use a very sturdy chair when using Excy as a chair cycle! Welcome to day 26 of the Excy Move More Challenge. Today, we focus on getting our shoulders open. So often, whether at our computers, on our phones, driving our cars, or even enjoying a long bike ride, our shoulders are in a scrunched position. This is a more difficult position that allows you to cycle your arms toward the back of the body and is a great exercise for stretching and opening up the shoulders. Adding a small step stool can be helpful to get the hang of it. You should never experience pain while using Excy. If you do, stop immediately. Always consult a doctor before starting a new exercise routine and consult your physical therapist if you have an injury or history of injury. Welcome to day 27 of the Excy Move More Challenge. We are getting close to wrapping up this 30-day introductory challenge to getting to know your Excy portable cross training system, so today, we introduce a more challenging Excy move. Using the Keeper (to keep the Excy system from scooting away) and the Stability Bar (to give you extra stability), today we cycle our legs while getting in a full bridge exercise position. On its own, the bridge is an effective exercise for toning glutes and working your core, but add some Excy resistance and cycling your legs and now we are talking about really spreading the tension to work your hip flexors, quads, obliques, hamstrings and calf muscles. A slight tilt of the pelvis really engages the core, but getting up into a bridge exercise position will challenge you even more. To See Future Live Stream Excy Move More Challenges, Tune Into www.excy.live. All Workouts will be added to this page as they are completed!